Cleland: ... I think it is general knowledge that Second Mile and its various fund raisings have been the object of some investigations by some agencies. I don't know if it's the grand jury, FBI, U.S. Attorney, or somewhat but there are currently ongoing investigations. (Prosecutor Frank) Fina: I think that's very fair to say, Your Honor. In a five-part series on The Second Mile published last month, Sara Ganim wrote about the multi-front investigations into the charity. And as even the Freeh report revealed, the Pennsylvania Department of Public Welfare appears to have botched things as far back as 1998, when Sandusky was first investigated (though not charged with a crime) for touching a boy in a shower. But more on that later. But what did The Second Mile know, and when did it know it? Ganim's five-part series says the charity did not know about the 1998 investigation of Sandusky; the Pennsylvania attorney general's office says it did. Last November, Penn State outside general counsel Wendell Courtney denied that he had also represented The Second Mile back in '98, but the AG's office said it had evidence that showed Courtney did in fact work for the charity at the time. On the weekend Sandusky was arrested, Courtney told the New York Times he was aware of the '98 investigation when it happened. Yet the Freeh report turned up an email from the day Sandusky was charged, in which Courtney told Penn State's former senior vice president for business and administration Gary Schultz, "I was never aware that 'Penn State police investigated inappropriate touching in a shower' in 1998." All of which is just weird. Last November, in the wake of Sandusky's arrest, Jack Raykovitz, The Second Mile's executive director, resigned and The Second Mile launched an internal investigation to figure out who knew what and when. Raykovitz's wife, Katherine Genovese, was The Second Mile's vice president. She was laid off just after Sandusky's arrest as contributions to the charity dried up. According to Ganim, Raykovitz and Genovese have testified before the grand jury. Raykovitz's successor, David Woodle, abandoned that internal inquiry a month later so the foundation could plot its future instead, specifically by trying to transfer its assets to a charity based in Texas. That plan has since been postponed pending lawsuits against The Second Mile. According to the grand jury presentment, Curley told Raykovitz only that someone had witnessed something inappropriate, it was investigated and the result was to tell Sandusky not to shower on campus with kids. Raykovitz in turn told a few members of his staff and the board's executive members what Curley had told him. Bruce Heim was one of them. Heim asked Raykovitz if anything inappropriate happened between the boy and Sandusky, and Raykovitz answered, "No." That's what Raykovitz believed, based on what Curley had told him. "They looked into it," Raykovitz told Heim, according to Heim's memory. "And nothing inappropriate happened." Raykovitz then asked Heim—a local real estate investor and someone who isn't shy about his loyalty to Penn State, the Paterno family and many of the key players in this scandal—if he should relay this to the full board. "And I said no," Heim said. "For five years, I worked out at the football facility, several times a week, and saw Jerry showering with children," he said. "I said I don't think it's relevant. It happens every day at the YMCA. I remember the conversation specifically because it seemed like a nonstarter because of what Penn State said went on." On that advice, Raykovitz didn't tell the board. He did have a talk with Sandusky, and told him to be more careful. He told him to be more careful. Jack Raykovitz is a licensed psychologist. According to Ganim, The Second Mile took no action against Sandusky until November 2008, when a 15-year-old boy in Clinton County accused him of inappropriate touching. That boy is now known as Victim 1, and his complaint triggered the investigations that led to all the others. Raykovitz removed Sandusky from the charity's programs and urged him to stay away from children even beyond his work with the charity. 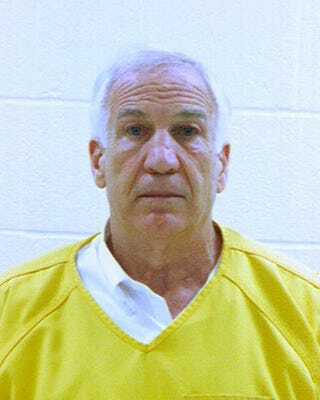 By November 2009, Sandusky met with The Second Mile's board of directors to tell them he was resigning. Publicly, the spin would be that he wanted to spend more time with his family. But at that meeting, Sandusky told the board he was stepping aside because he was under investigation for molesting a child. Ganim reports that there was disagreement among individual board members about whether to stay silent. But that's ultimately what they decided to do. By then, it had been 18 months since board members were told about the investigation, and some of them were getting antsy. Many were hearing rumors that the investigation was expanding—it was—and that The Second Mile was under scrutiny. But few answers were coming from Raykovitz, said two of them, who spoke on the condition of anonymity. Considering that Marshall was out every day asking people to write checks to the charity, "I'm feeling more and more that, yes, I was deliberately kept out of things I should have known about and that my staff should have known about," she said. "We were brought in much later than what would have been above board." Ganim's report says Raykovitz and Genovese were aware that the grand jury was looking into allegations back before Victim 1's, but that this was "unbeknownst to the full board." To date, no one other than Curley and Schultz, the two Penn State administrators, has been charged with a crime in connection with the Sandusky case.